In the game of repurposing leftovers, desserts always win. There are rice and bread puddings, noodle kugel. But nothing beats the healthy grain gone sweet. Now, I give you this. Unless you use them often and with ease, your sesame seeds are growing stale in a 4-ounce “spice” jar, cast aside the nuts. Grab that jar to make these candies, reminiscent of those sold in Middle Eastern groceries. 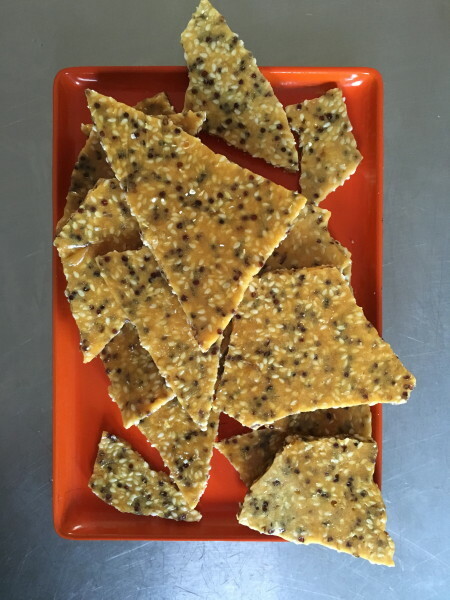 The combination of red quinoa and sesame seeds makes a delicious, speckled confection. Start with a good batch of quinoa, not mediocre leftovers from the prepared foods aisle that you can no longer force yourself to eat. Dry the cooked quinoa well before making brittle, or the residual moisture trapped in the grain will prevent the brittle from hardening completely. Unless you are familiar with making candy, use a reliable candy thermometer. The brittle’s contents will triple in volume as it cooks, so it requires an oversized pot. Resist the urge to transfer this small amount of water to a smaller pot. When caramelizing anything, evenness is key, and the slower you proceed, the more rewarding the results. 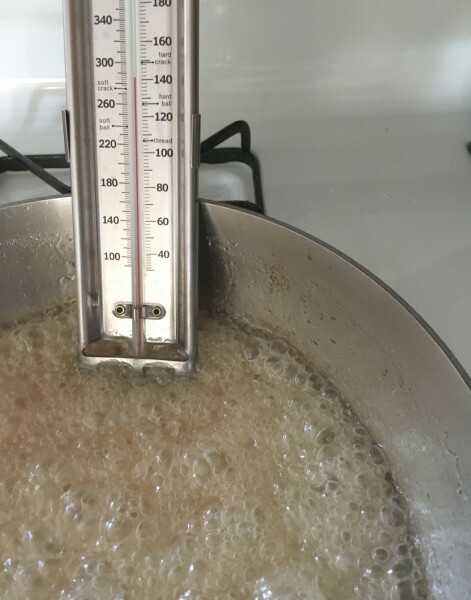 The temperature of your boiling sugar mixture will rise to 200 degrees pretty quickly, but a brittle must be cooked to 300 (hard crack) and, employing the good patience you should, that can take a little while. On medium low heat, the sugars can take up to 10 minutes to caramelize. If this is your first time making candy, I suggest your pour yourself a cup of coffee, pull up a stool, and watch the caramelization process unfold. You’ll see the sugar water turn from tiny, rapid-fire bubbles, to larger, slower, thicker ones. Typically, the bubbles start in one part of the pot and catch on to the rest in time. Resist the urge to move or tilt the pot—it can take care of itself–and do not stir a thing. Spread quinoa and sesame seeds onto a baking pan. Toast, stirring occasionally, until the sesame seeds are golden and the quinoa is dry, about 10 minutes. Do not let the quinoa burn. Once toasted, remove from oven and pour into small bowl. Set baking pan aside to cool. Add water to a medium saucepan over medium low heat. Into the center of the water—and without stirring–carefully pour the sugar, corn syrup, and butter, in turn. Do not let any sugar or corn syrup hit the sides of the pot—errant sugars could interfere with the candying process. Anyway, as the water heats up, the ingredients will dissolve on their own. Once dissolved, secure your candy thermometer in place. Meanwhile, prepare your now-cooled baking pan with a light rub of butter or line it with a nonstick baking sheet. Coat a heat-proof rubber spatula with butter, too, and set both aside. Next, measure out and join together pieces of plastic wrap, the full length and width of this tray, and set aside. Lastly, grab a rolling pin. You’ll use the pin and plastic to smooth the very hot caramel before it cools. Measure your baking soda and salt in a small bowl, placing it and the bowl of quinoa and sesame just next to the stove. Now, wait. When the temperature reaches 280, you’re getting close. It rises quickly these last twenty degrees—don’t walk away from the stove. At 300, you’ll see the large, foamy bubbles turn instantly golden brown. The next steps, you’ll do in quick succession: Turn off the heat, give the pot a little swish to even the caramelization, and with the prepared spatula, stir in the baking soda/salt then the quinoa/sesame. Pour onto the prepared baking tray, spreading it to 1/8 inch thick. Once the hot brittle begins to resist the spatula, set the spatula aside and grab the plastic wrap. Carefully cover the brittle with the plastic, then roll the brittle with the pin to 1/8 inch thick. Pay particular attention to the center of the tray, likely the thickest part. Remove the plastic and let cool completely. Once cool, the brittle should lift as one shiny, clear, golden piece. You can break it into snackable sizes at your discretion, with your hands or a knife. Store in an airtight jar, for up to 3 weeks.